This view of Main Street, looking south from Eagle Street, indicates the start of one of downtown Buffalo’s most dramatic transformations. The year is 1964, and clearance of the entire block between Main, Eagle, North Division, and Washington streets is slated for what would become One M&T Plaza. A billboard announces, “This block is the site of the new building, Manufacturers and Traders Trust Company.” In the background, demolition is underway on the old Bank of Buffalo, an Indiana limestone structure built in 1916 and designed by McKim, Mead & White. 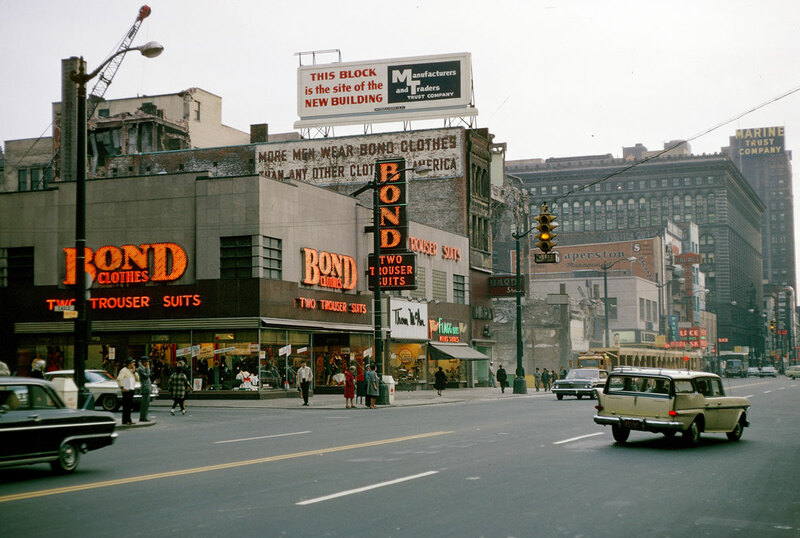 In the foreground, Bond Clothes, Thom McAn shoes, and Flagg Bros. shoes are still in operation, in spite of having been purchased with plans for demolition in 1961. The start of construction on One M&T Plaza was the first step in the Downtown Urban Renewal Project, which would, by 1968, include the destruction of dozens of buildings making up the heart of the downtown shopping district. The result in this one block—One M&T Plaza—is arguably the city’s best example of the International Style, designed by Minoru Yamasaki & Associates to be warmer and friendlier than the off-the-shelf glass box. The project was also part of the systematic replacement of downtown’s complexity with a monoculture of office buildings and parking facilities, a process that would extend well into the 1990s. Before construction began, the Buffalo Division of Planning found that the corner of Main and Eagle streets had the highest pedestrian count of any single location in Western New York. After construction was completed, the building blocks of this vitality—the many small-scale buildings with ground-floor commercial frontage—were dismantled.